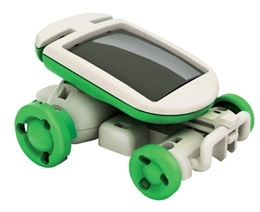 This is a FANTASTIC educational kit for future inventors and innovators out there. 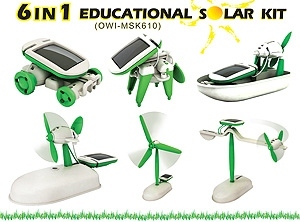 To see the benefits of solar energy applications first hand, I literally JUST purchased one of these solar kits to build with my daughter- perhaps one day my son. Normally this puppy goes around $18 bucks, but I'm cheap. That's why I got it for $7.98 on eBay! Now they have it even cheaper! That's right- eBay has got it for $2.99 + $4.99 shipping AND LESS!. $2.99 purchases are limited to 1 per person. S/he's also selling them at $5.99. Coming direct from Hong Kong, my HK experience says shipping will take 2-3 weeks, though it's not stated on the listing. Honestly, I really think I would have bought it for the $5.99 too, considering I've been checking these things out for a while at the aforementioned price. Shipped from Hong Kong, it may take a while, but Christmas is plenty far away. Working solar cells are so expensive. Of course, cheap toys like this will not have good ones - maybe from a recycled old/dying cells. Hosted by HostNine This page was created in 0.0043249130249 seconds.